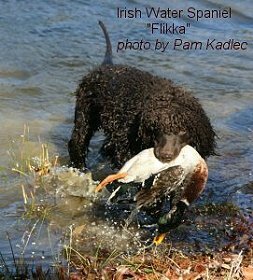 In the last issue, we discussed conditioning your dog to "hold" and did some basic lessons The easiest way to teach pup to hold his birds is by conditioning pup never to drop them in the first place. When you bring pup home and are playing hallway retrieves, let him parade and carry his sock dummy. Put one hand on his chest to stop forward motion and with the other gently push his rump down. During the whole time, pup has a death grip on his dummy. If he drops it, don’t worry. The key here is to teach pup to sit when he delivers his bird. 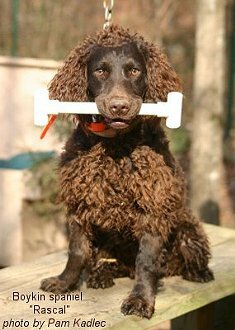 Don’t grab at the dummy or you will teach pup to play keep-away or to clamp down on his birds. When pup is sitting, gently pry his mouth open and take the dummy, saying, "drop". The same thing goes out in the yard. With pup on a check cord, toss a bumper or a bird. If pup doesn’t come straight back to you, reel him in. While letting him hold his prize, push his rump down and make him sit. Then gently pry his mouth open and tell him to drop. Okay, that’s all well and good with a new pup. But what if you have an older dog that hasn’t been conditioned to hold? You have done all the steps outlined in the last issue, however, pup doesn’t seem to understand or he is dictating the sessions. If pup learns that he can get away with dropping his birds and you will pick them up for him, then gradually he will exhibit other behaviors that put you below the pup in the pecking order. The fetch command is the same as any other command - you are not asking pup to do something, you are telling him. Before you start this process, read the entire article and think about it. Can you do this and follow through? Some dogs "get it" and go through the process in a couple of weeks. I have had some cases that took six weeks of solid conditioning - fighting me all the way. 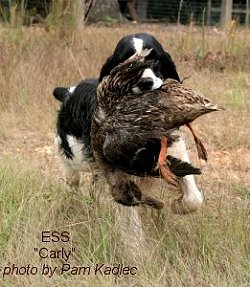 If your pup is a hunting dog who naturally fetches and holds his birds, then you can work on the hold without subjecting the pup to the force-fetch (FF) process. If you want to play field trial games and pup has a sloppy delivery, is hard-mouthed - or so soft-mouthed everything just falls out - then conditioning the fetch is required. If you don’t feel comfortable with the process, send pup to a professional - one that comes highly recommended, as improper force-fetch conditioning is worse than none at all. "The fetch command is the same as any other command - you are not asking pup to do something, you are telling him." Since you have worked pup and now he will hold and carry anything you put in his mouth, it’s time to condition the fetch. Begin with pup on the bench and by slipping your fingers under his collar. With the same hand, reach for the ear leather - pinching the ear between your thumbnail and forefinger. When pup opens his mouth to protest, put the pvc pipe in and say, "good fetch". If pup doesn’t seem to feel the ear pressure, try a different area of the same ear. The idea is to cause discomfort. As soon as pup opens his mouth, you put the object in and stop the pressure at the same time. Your hand is under the collar to control pup's head so that he grabs the object rather than your hand. Move pup around and repeat. Walking eases the tension and breaks up the lesson. Also, you want pup to learn that he has to fetch wherever he is - not just in one spot. For the first lesson, repeat the process until pup will fetch the pvc one time without any ear pressure. At the next session, refresh pup's memory by working with the pvc until he will fetch it one time without ear pressure. Now, replace the pvc with the wooden dowel. Apply ear pressure until pup opens his mouth to fetch. Repeat until pup will fetch the dowel without ear pressure. Offer the pvc and get pup to fetch the pvc and the dowel without ear pressure. Stop there. Always start the next session where the last one left off to give pup a chance to have a positive start to the lesson. Once pup will fetch the pvc and the dowel out of your hand, have pup carry the objects - one at a time - down the bench and sit to deliver. Since you have already conditioned the hold, this shouldn’t be a problem. If he spits out the object, immediately pinch the ear (making sure your hand is under the collar) and maintain pressure until the fetch is completed. It helps to have extra pvc pieces in your pocket for this part so that you aren’t losing time by bending down to the ground to find the piece of pipe. When pup will hold and carry, the next step is to have pup fetch on the move. Walk pup with your hand under the collar and hold the pvc with the other hand and encourage pup to reach for the fetch. Some dogs freeze up - so be patient - but at the same time, don’t let up on the ear pressure until pup complies. Work pup going up and down the bench until he will willingly fetch while moving. Always have pup sit to deliver. When you get to the point where pup won’t let go of the pvc you know he is getting the idea. Don’t get angry with pup for this. Rather, gently reach inside the back of pup's mouth and push down on his tongue commanding pup "drop" or "give". Never pull anything from pup's mouth – always push it back toward his throat - which will cause him to reflexively gag and open his mouth. Have pup reach for the pvc and dowel. When he is doing each without ear pressure, it’s time for the next step. Place the pvc dumbbell (pvc pipe with two pvc ‘t’s attached) on the bench. Walk pup with your hand under the collar and the pvc sitting on the bench so that pup can easily grab it, lead him to the pipe with the fetch command. Do not put your hand down but guide pup's head to the pipe, applying ear pressure as needed, to complete the fetch. Have pup fetch, carry and sit to deliver. Repeat until pup will fetch off the bench without ear pressure. If pup picks up this concept quickly, replace the pvc with the wooden dowel and repeat as needed. We’ve done all the pressure stuff so far with non-bird items so that pup doesn’t get soured on retrieving. If the pup has a strong retrieving drive, I will reward them at the end of each lesson with a couple of bumpers. If pup's feelings are hurt and he refuses to fetch, just put him up and don’t worry about it. In this case, I don’t do any retrieves until the FF is completed. The highly driven dogs will always fetch and the bumpers at the end of the session are a great release of tension. Now it’s time to condition the fetch with bumpers and birds. Have pup fetch a bumper out of your hand. Hopefully by now pup understands the game and will fetch without any ear pressure. If not, grab the collar and the ear and refresh pup's memory. As soon as he fetches out of your hand - and he sits to deliver, do a walking fetch and then fetch off the bench. This should go fairly smoothly since pup has been through all this before with the pvc and the wooden dowel. It’s all a matter of transferring the knowledge to a new object. If pup gives you a battle, don’t move on until he concedes. Alternate objects with known fetching tools - the pvc and the wooden dowel with the bumper - until pup will fetch anything and everything that you offer. I like to use different types of bumpers: small canvas puppy size, hard knobby, soft knobby and small dokkens - so you enforce the idea that pup fetches anything and everything you ask. You can even throw in a small plastic water bottle. The water bottle is an unusual object that pup wouldn’t normally fetch and it’s purpose is simply to enforce that fetch means fetch - no matter what. You never can tell... someday, you may be up the creek without the proverbial paddle and need some assistance! Once pup will fetch all of the above articles (except the paddle!) it’s time to finally move on to birds. Some dogs will race in to fetch birds; others will give you a fight - so be prepared. First, I place the bird in the pup's mouth with the fetch command. Next, place your hand under the collar and be ready to use ear pressure as you command pup to fetch the bird out of your hand. As soon as he will, place the bird on the bench and be ready to apply ear pressure as needed. When pup will fetch, hold, carry and deliver the bird to hand, half of the battle is over. It’s time to move the lessons to the ground. If you started all of this on the ground, you can skip this section. The advantage to using the bench is twofold – the dog is elevated where he is less comfortable and you don’t have to bend over and strain your back. When I move to the ground, I don’t go all the way back to the pvc and wooden dowel. Put a check cord on pup. Start off with a bumper and have pup fetch out of your hand, then walking fetch out of your hand, keeping pup moving and reaching for the bumper. Next, drop the bumper on the ground. With your hand hooked in his collar and holding the ear, command the fetch. When pup will fetch quickly off the ground, toss the bumper a few feet and command the fetch. If pup runs out and blinks the bumper (refuses to pick it up), go to him and use ear pressure to get the job done. Take the check cord. Have pup walk and carry the bumper back to the initial line, sit and deliver. I like to take the pup for a walk as I work on his fetch. He’s not stagnant as on the bench and he learns to fetch in any area that I ask. This may take one lesson or five – read your dog and adjust accordingly. When you can throw the bumper several yards and pup will run out, fetch it up, return willingly (without you having to reel him in) and sit to deliver - then it’s time to move to birds. "Keep in mind that there will still be times when you will have to reinforce the fetch and you must be always prepared to do so." Just as on the bench when I first move the fetch of birds to the ground, I start with the bird in my hand. Then I place it on the ground and lastly, toss it a few feet – just as you did with the bumper. I keep a bumper handy so that if pup is having difficulties grasping the concept, I toss a bumper down (which he readily runs out and grabs) and then try the bird again. Use ear pressure as needed – do not let pup dictate what he will and will not fetch. 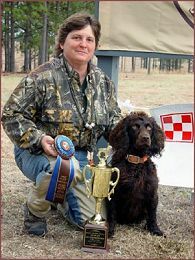 I found that with most spaniels - as well as other soft-tempered breeds - offering an "out" by easing the pressure often speeds up the process rather than slowing it down. If you toss a bumper followed by a bird and keep alternating between the two, pup can grasp the idea better than continually forcing the bird. Some dogs will push back and fight you until they finally shut down, entirely - and will refuse to do anything. Before this happens, give the pup a mental picture by letting him complete an easier task (fetching a bumper). If you’ve pushed too far and that doesn’t work, put pup up and leave him to think about it for a few days. Do basic obedience work and no pressure - all positive lessons. When you go back to the fetch, start off with the bumper in the hand, again and slowly progress until you can get pup to hold, carry, sit and deliver a bird. Take pup on walks and work him with the bird as you did with the bumper, toss it a few feet, then a few yards as pup gets the idea. Have an assistant throw bumpers and birds. 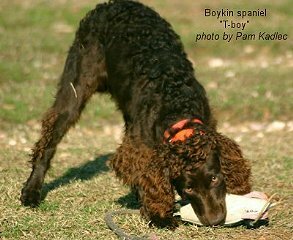 If pup blinks them, go out to him, grab him by the collar and the ear and walk him to the bumper or bird (keeping pressure on the ear) until he fetches. He will learn that he can’t get away with not fetching, as there are consequences (sore ear). Last, but not least is transferring this information to the water. Get out your waders and be prepared to go in and force the fetch. If the dog has a strong retrieve and water drive, this may not be an issue. Obviously, you don’t want to toss the bumper in deep water. Start off as if the dog is a young pup and toss it right at the water’s edge. Use ear pressure, as needed, if pup refuses. Repeat with the bumper going out a little farther each time. Have some extra bumpers on hand so that if pup refuses and the water is too deep for you, an extra bumper can be tossed in closer to get the correction. Repeat until pup will fetch without assistance. On the next session, work with birds in the water. When this is successful, the force-fetch is almost complete. Keep in mind that there will still be times when you will have to reinforce the fetch and you must be always prepared to do so. For those using an e-collar in their training, I will revisit this article in the next issue and explain how I use the e-collar for the FF and the force to the pile. I still start off everything the same way as in this article with a few changes. Stay tuned and good luck with your pup!